1 - Chemical Modification of Clay Surfaces (Fernando Wypych). 2 - Electrokinetic Behavior of Clay Surfaces (Mehmet Sabri &Çcedil;elik). 3 - Surface Thermodynamics of Clays (B.S. Jai Prakash). 4 - Phenomenology of Water at Clay Surfaces (Jean Marc Douillard, Fabrice Salles). 5 - A Worksheet Model for Adsorption/Desorption of Ions on Clay Surfaces (Giora. Rytwo). 6 - Raman and Infrared Spectroscopic Studies of kaolinite Surfaces Modified by Intercalation (R.L. Frost, Janos Kristof). 7 - Nuclear Magnetic Resonance Spectroscopy of Molecules and Ions at Clay Surfaces (Jean Grandjean). 8 - Pesticide-Clay Interactions and Formulations (Juan Cornejo et al.). 9 - Pharmaceutical and Cosmetic Applications of Clays (A. Löpez-Galindo, C. Viseras). 10 - Removal of Metals by Natural and Modified Clays (C. Volzone). 11 - Catalytic and Adsorption Properties of Modified Clay Surfaces (A. Moronta). 12 - Preparation of Layered Double Hydroxides (Eiji Kanezaki). 13 - Polyoxometalate Complexes of Layered Double Hydroxides (Changwen Hu, Danfeng Li). 14 - Cationic and Anionic Clays for Biological Applications (Jin-Ho Choy, Man Park). 15 - Environmental Remediation Involving Layered Double Hydroxides (C. Forano). 16 - Layered Double Hydroxide/Polymer Nanocomposites (F. Leroux, J.-P. Besse). 17 - Catalytic Properties of Hydrotalcite-type Anionic Clays (Simone Albertazzi et al.). Clay plays an important role in everyday life. This versatile mineral is used in housing, improving the environment as a waste treatment material and also in biological applications and medical health care. Clay Surfaces contains 17 chapters which deal with various aspects of natural and man made (synthetic) clay. 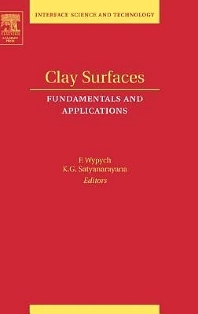 Well written by experts in both experimental and theoretical areas, this book takes the reader into the fascinating world of the chemistry and physics of clay mineral surfaces and interfaces as well as the complex phenomena on the surfaces involved in clay related systems. This book will provide a better understanding of the intervention mechanisms of interactions of soils in contact with wastes, actions to be taken in the case of chemical spillage, methods to improve the production of food without affecting the ecological balance, increased fixation of carbon in the soil to increase grain production and reduction of carbon dioxide release into the atmosphere. Applications covered describe the role of clays in environmental remediation and the pharmaceutical and cosmetic industries. This book looks at theory and applications of both natural and modified clays from academic and industrial viewpoints. With broad appeal, this book is suitable for specialists directly involved in clay science and those undergraduate and graduate student studying related areas. Researchers, academics and practitioners in the fields of clay science, surface science, colloid science, solid state chemistry, catalysis and materials chemistry and engineering.